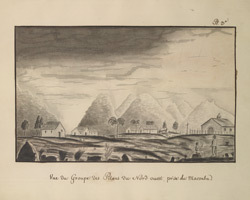 Sketch of the mountain range in the north west of Martinique drawn from the Macoube. In the foreground can be seen some small brick buildings and a chapel. It was drawn by Alexander Moreau de Jonnès (1778 ? 1870) in approximately 1808. Jonnès served in the French Navy and was first posted to Martinique in 1803.